Last year the weather in GR must have been pretty nice in March and April, because I remember passing my maternity leave days with long walks pushing a beautiful, tiny, sleeping baby in a stroller. Those days are long gone (tear), but finally here at the end of April we once again have a few warm sunny days to enjoy. Now that our baby is no longer a baby, outside time has become a bit more complicated. Babies are satisfied to lay on blankets and gaga at the clouds, but toddlers want to PLAY! And I must say, although I miss the old days, playing really is so much more fun. Last week we put together a few of Luke's birthday presents to enjoy. 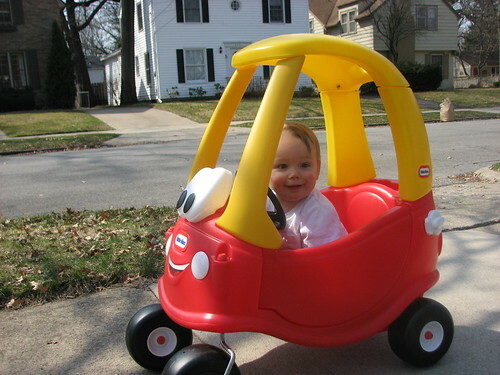 Our current favorite is the Cozy Coupe Car. It's perfect for zooming up and down driveway and sidewalk. Beep Beep! To Grandmother's house we go! 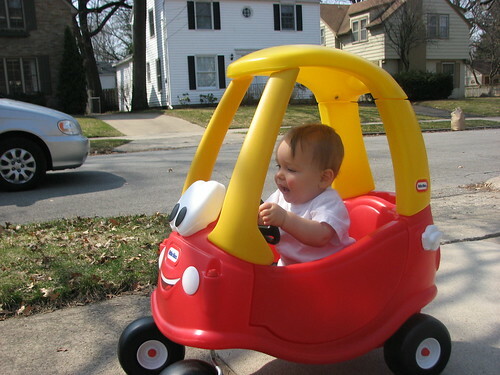 Actually, I wish we COULD have peddled the Cozy Coupe down to Grandmother's house, since our trip to Ann Arbor last weekend cost us a whopping $4.18 a gallon :( Sign me up, Flintstones!